I have long been a clipless pedals guy. 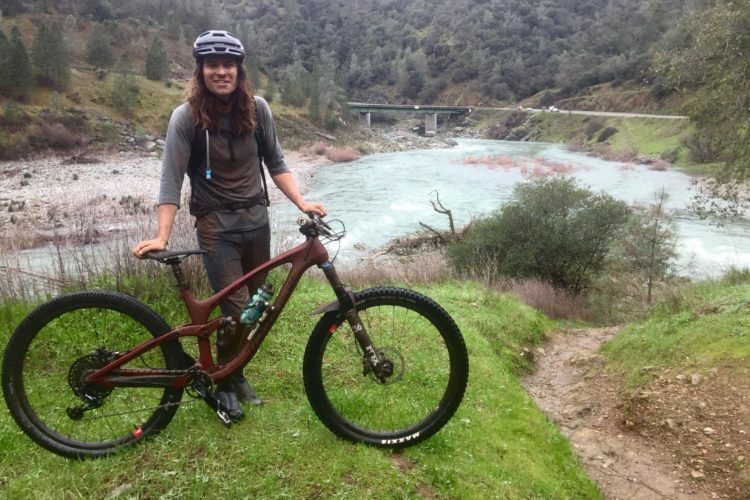 In fact, I cannot remember the last time I rode with anything else–maybe 15 years ago when I used a Wal-Mart bike to commute around my small town. 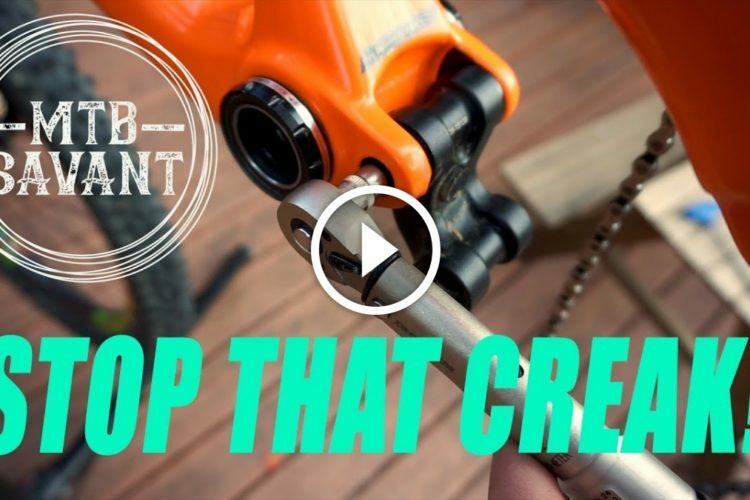 So, after reading a plethora of articles in various biking magazines about the merits of flats over clipless pedals last year, I was curious about trying them. 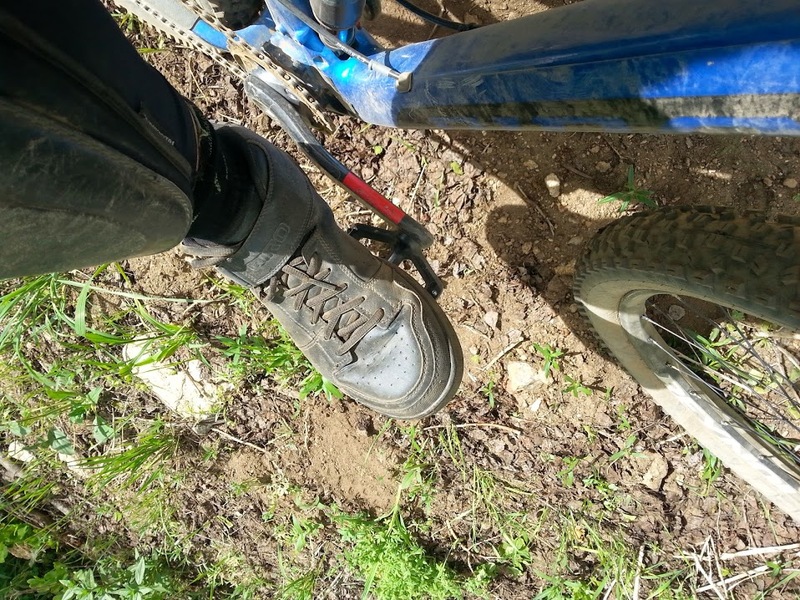 I subsequently developed an itch to swap my gnarly Spike Spank pedals from my fatbike–which I use with 45NRTH Wolvhammer boots in winter–over to my trail bike in the spring/summer, so it was time to try a proper summer DH/park shoe to shred the Spanks. 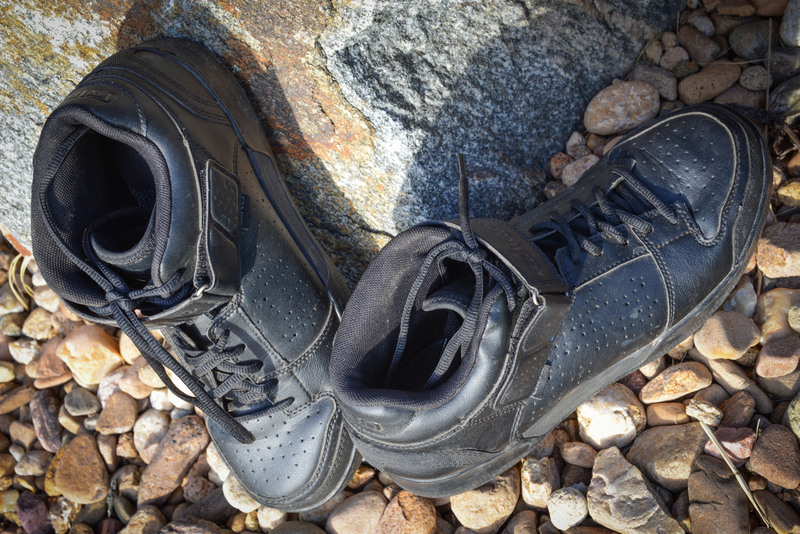 The Giro Jacket Mid flat pedal mountain bike shoes fit the bill quite well. 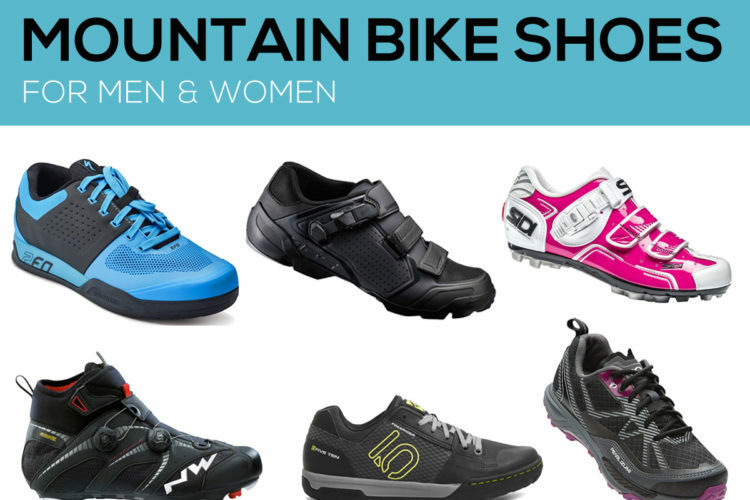 To be honest, last season I had purchased another highly-acclaimed pair of DH shoes to compliment my pedals, but I gave up on them after a few rides because they were so uncomfortable. They fit fine off of the bike, but after about 30 minutes of riding, all I could think about was getting those things off of my feet. I can’t blame the manufacturer, per se, but they just didn’t work for me, and I bought them because so many pros swear by them. 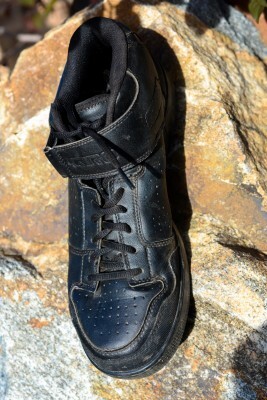 What immediately stood out about the Jacket Mid, however, is the asymmetrical semi-high top design, a feature I wish was more common across the spectrum of all mountain biking footwear. Moreover, the padding is on the inside, not the outside, which preserves ankle mobility while protecting the medial malleolus, or inner ankle. Unless you suffer from “cankles,” this highly-innervated part of the foot is so sensitive that a good whack can bring a pro linebacker to his knees in agony. How many times have we all slammed our ankles on the cranks, or landed in a pile after an unexpected crash, and our ankles were the one bit of our anatomy reminding of us our fragile mortality? Ouch. So, first of all, kudos to Giro for giving this shoe synthetic cankles, made of a very high quality synthetic leather for rowdy park days or the occasional OMG moments. 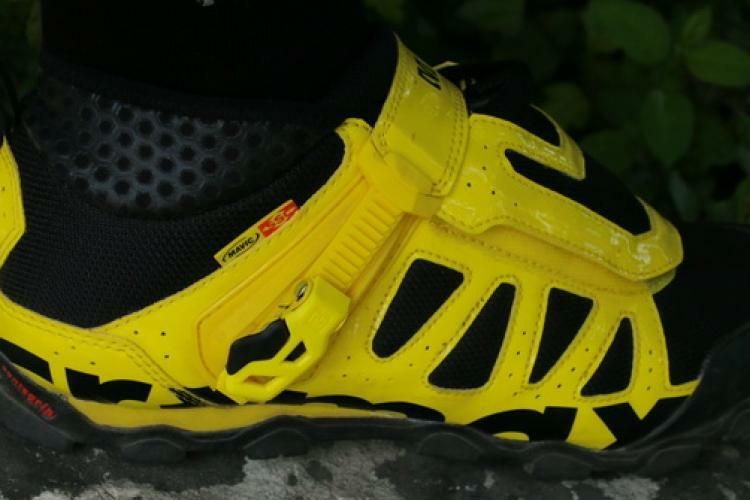 The upper is manufactured with the same water-resistant faux-cow that is reasonably breathable and comfortable on both long climbs and jostling descents. There is a rubber toe cap that provides extra protection from slamming your foot on terra firma, and the laces and lace-keeper strap maintain a solid-but-comfortable fit for both the foot and ankle. 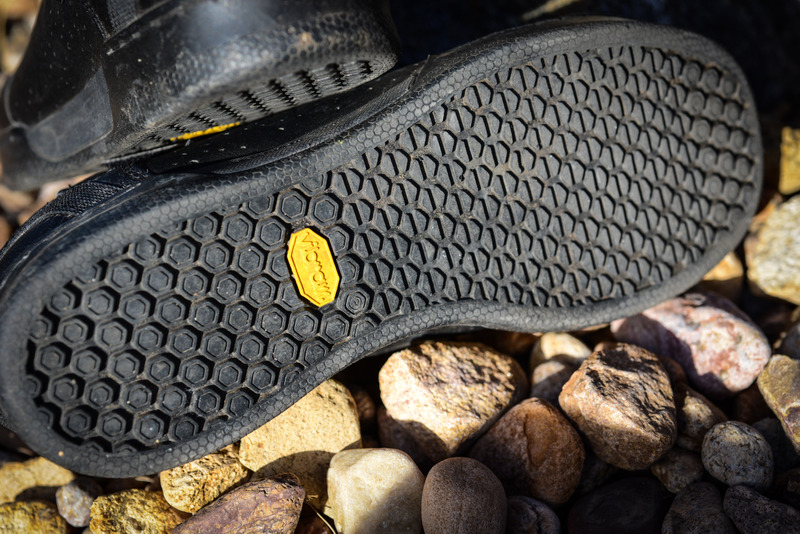 The outsole is good ole Vibram® MegaGrip™, designed to glue your foot to flat pedals and keep them there. Another feature that stands out is the footbed, engineered with what Giro terms an EVA midsole with Poron® XRD™ heel cushioning, with built-in arch support and an anti-microbial treatment from Aegis® . It’s just plain good shoe engineering. My overall impression of these kicks is extremely favorable, with very few concerns. 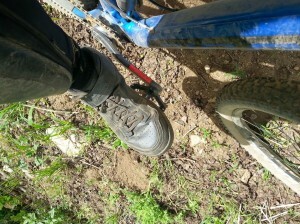 First of all, the Jacket Mid is much more comfortable than many of the other DH shoes that I have tried. 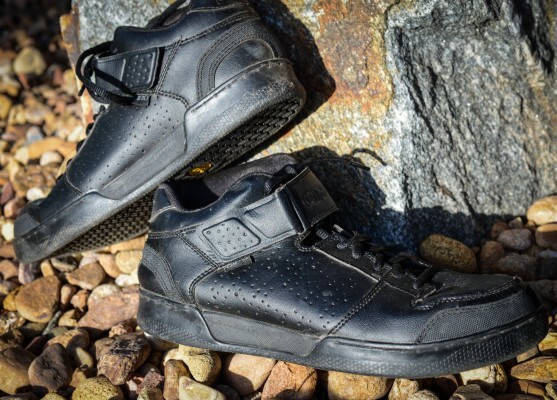 It takes a little extra effort to get your foot snugged into the high-top, with long laces and the lace-keeper taking a few extra seconds to get the fit just right, but once you do, you’re set. They can easily be worn all day, and as kick-around shoes after rides. No need to change into sneakers for a few suds with the buds after hitting it hard. 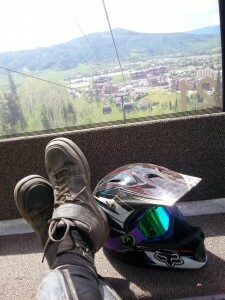 After dozens of rides, I never felt the need to tear them off and let my feet breathe. The Giros are also both versatile and durable. I tested them in the late winter, in the spring, and summer, with temperatures ranging from 40 to 85 degrees Fahrenheit. Although they were a little uncomfortable at the extremes of this range, they were right at home from 50-80 degrees Fahrenheit with proper socks. On long, unforgiving steep climbs in the front range of Colorado, I did develop some tingling in my toes after about 30-40 minutes, but this was usually alleviated by changing my foot position. Also understandable on 20 percent grades. More importantly, I never felt hotspots or had cramps in my feet. As a principal DH shoe, they were flawless on rambunctious descents in the rocky foothills around central Colorado, in the park, and during downhill runs at Steamboat Bike Park. 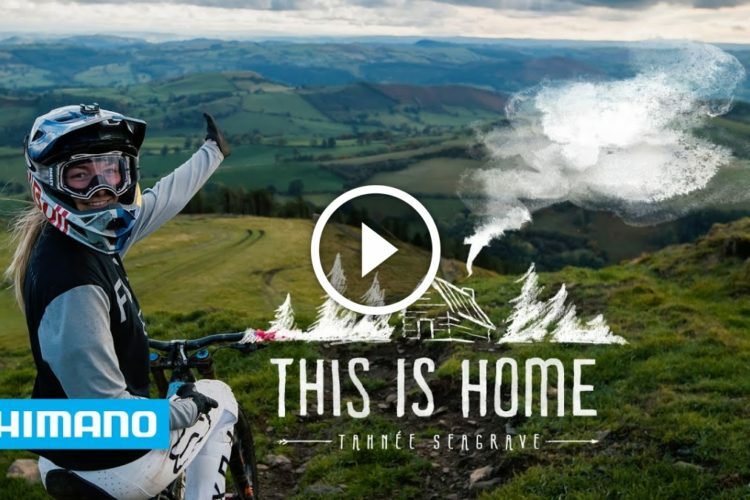 The grip was not so strong that I couldn’t move my foot around for jumps, but stayed glued over chunder, in tight, fast berms, and under heavy braking. After several months of abuse, they are worn in but not worn out. I expect to get at least another season or two out of them, which helps justify the $140 pricetag. You get what you pay for, ladies and gentlemen. 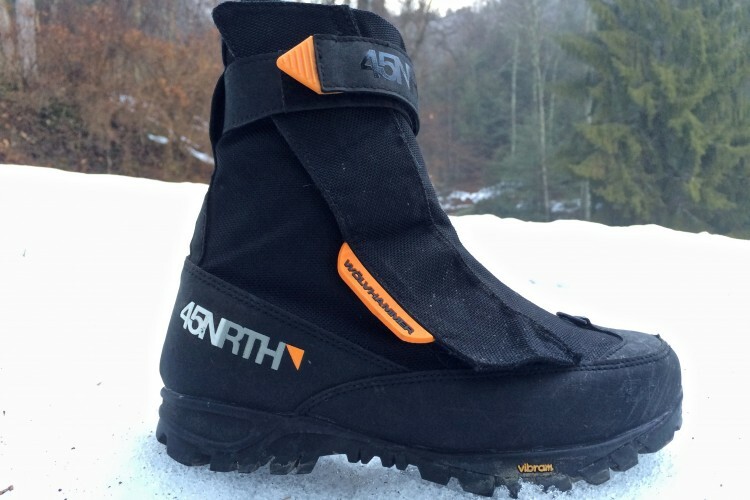 At 445 grams, these are not the lightest shoe on the market either, but the few extra grams are worth the quality craftsmanship, durability, fit, and extra protection. Like most good things in life, they only come in black. 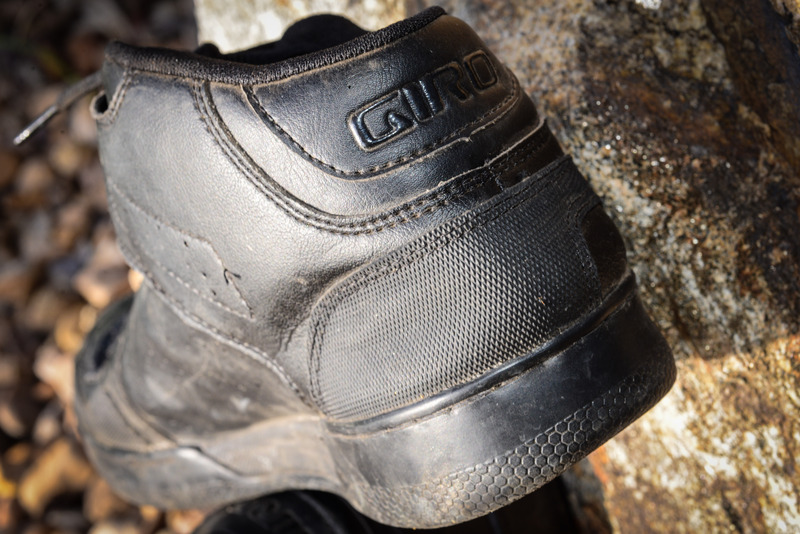 If you are looking for a no-holds-barred park or DH shoe, the Giro Jacket Mid is worth taking a second look at. 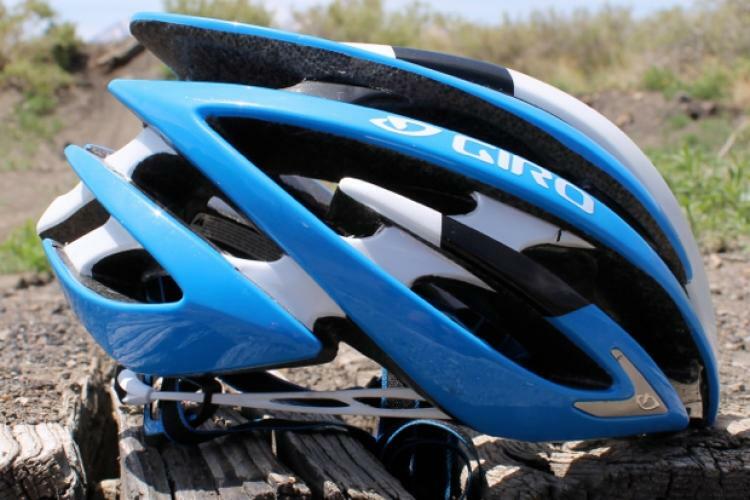 Thanks so much to Giro for sending over the Jacket Mid for review!